Published: Sept. 10, 2018 at 02:09 a.m. Updated: Sept. 17, 2018 at 07:31 p.m. Looking to improve your fantasy football team? The best way to do is by adding the hottest names in the National Football League off the waiver wire. Each week, I'll hook you up with (at least) 10 players you'll want to target. For more fantasy analysis and information, check me out on Twitter, Facebook, YouTube and Instagram! The Jaguars lost Leonard Fournette to an injured hamstring in their opener, which created a chance for T.J. Yeldon to shine. He went on to finish with seven targets (three catches) while also leading the backfield in touches and snaps (65 percent). 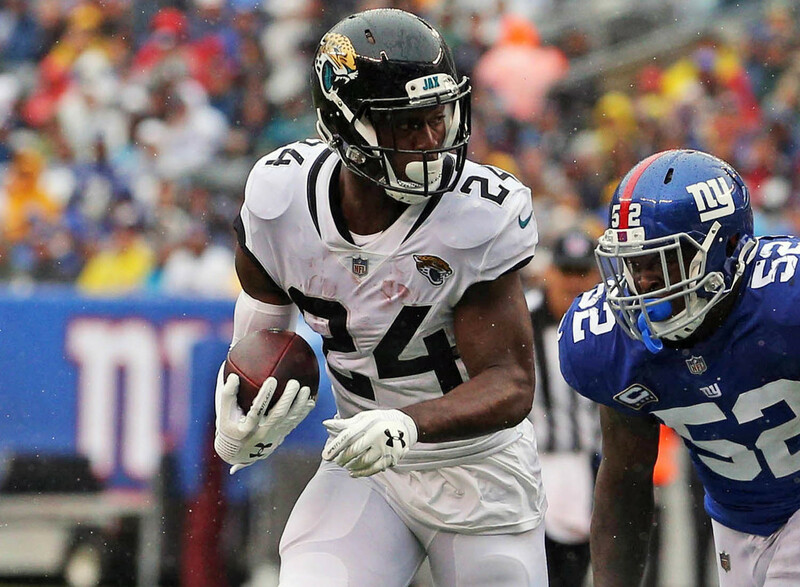 If Fournette is forced to miss time due to his ailment, Yeldon would be on the fantasy radar as a potential flex starter in Week 2 against the New England Patriots. One of my favorite preseason sleepers, Godwin saw just four targets but still finished with three catches, 41 yards, one touchdown and 13.1 PPR points in a win over the New Orleans Saints. He was also second among Tampa wideouts with 43 snaps played, and the fact that DeSean Jackson suffered a concussion in the contest means Godwin could be even more involved in Week 2. He's a must-add wideout across the board. Lockett produced a nice stat line for fantasy fans against the Denver Broncos, posting three catches, 59 yards and one touchdown on just four targets. His target share could increase in the weeks to come, as Doug Baldwin suffered an injured knee that could cost him some time. Regardless, Lockett now needs to be owned in all leagues moving forward. Brandon Marshall should also be on your deep-league radar. Kittle, another of my favorite preseason sleepers, looked the part in San Francisco's Week 1 loss to the Minnesota Vikings. He led the team in targets (9) and catches (5) while also finishing with an impressive 14 PPR points. Kittle, who led all Niners tight ends in snaps (49) in the contest, has a tremendous rapport with quarterback Jimmy Garoppolo and needs to be owned in all fantasy leagues moving forward. Allison went off in the season opener, hauling in five of eight targets for 69 yards and one touchdown against the Chicago Bears. While he was third in snaps played (41) among Packers wideouts, he made his opportunities count. As long as Aaron Rodgers is healthy, Allison is a threat to post a nice stat line. While he is worth a roster spot, keep in mind that a tough game against the Minnesota Vikings looms. Admittedly, I was shocked to see how long Ekeler's ownership numbers were because he was drafted in most of the leagues I'm in. He went off against the Kansas City Chiefs, posting five catches (five targets) with 126 scrimmage yards and one touchdown. While his snap total was just 29 percent (Melvin Gordon came in at 74 percent), the talented backup should now be owned in most fantasy football leagues. This one hurts as a Royce Freeman truther, but Lindsay was the better fantasy running back for Denver in Week 1. He saw 25 snaps (a close second in the backfield behind Freeman's 29), but Lindsay saw more touches and scored more PPR points. While I still see Freeman as the back to own in fantasy leagues, I simply can't ignore the fact that Lindsay saw far more snaps and touches than most of us had predicted. Ginn become a nice Week 1 sleeper when it was announced that Cameron Meredith (knee) would be inactive against the Tampa Bay Buccaneers. He made good with five catches, 68 yards and one touchdown on 58 snaps (77 percent). As long as Meredith is out, the speedster out of Ohio State should be considered a potential flex starter when the matchup is favorable. He'll line up vs. the Cleveland Browns next week. Taylor went off in his first start for the Browns, throwing for 197 yards, rushing for another 77 yards and scoring two touchdowns in a 21-21 tie against the Pittsburgh Steelers. Next on the slate is a game against the New Orleans Saints, who made Ryan Fitzpatrick look like Dan Marino last week. Whether you're in need of a streamer of you just want quarterback depth, Taylor is well worth a look off the wire. Chris Hogan was the favored Patriots fantasy wide receiver in Week 1, but it was Dorsett who made the big impact. He led the position in targets (7) and was on the field for 55 snaps (77 percent), which was second behind Hogan's 66 (92 percent). Any wideout catching passes from the goat (Tom Brady) should be on the fantasy radar, and his usage suggests Dorsett is worth a look off the waiver wire this weekend. If the Week 1 stats are an indication, Grant is the surefire No. 2 wideout in Indianapolis. He finished Sunday's loss to the Cincinnati Bengals with nine targets, he led the team with eight receptions and his 61 snaps (79 percent) was second at the position to T.Y. Hilton. As long as Andrew Luck looks like, well, Andrew Luck, Grant is going to be on the radar as a potential contributor in all PPR formats.